Embargoed to 2100 Thursday May 14''Undated handout photo issued by the Royal Horticultural Society of nurse Sean Murray, the winner of the Great Chelsea Garden Challenge. PRESS ASSOCIATION Photo. Issue date: Thursday May 14, 2015. The BBC2 show saw six amateur garden designers compete against each other in a series of creative challenges, mentored by Gardener's World's Joe Swift, to win the chance to design a garden for the main avenue of the Chelsea Flower Show. See PA story CONSUMER Chelsea. Photo credit should read: Richard Hanmer/BBC/Royal Horticultural Society/PA Wire''NOTE TO EDITORS: This handout photo may only be used in for editorial reporting purposes for the contemporaneous illustration of events, things or the people in the image or facts mentioned in the caption. Reuse of the picture may require further permission from the copyright holder. The winner of the 2015 BBC Great Chelsea Garden Challenge will be sharing his tips and giving advice a special event in Longhirst tomorrow (Friday). 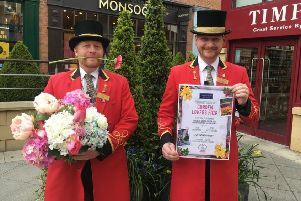 Ashington’s Sean Murray won the inaugural competition non television last year, earning him the chance to create a feature for Main Avenue at the 2015 Chelsea Flower Show. And at Longhirst Village Hall he will be sharing his experiences about the challenge and building his garden at the prestigious event. The garden was split into three sections and aimed at a couple nearing retirement with space for an art sculpture. There was a driveway featuring grasses providing a sensory effect when getting out the car and an attractive space when the car is away. The central section included a water feature which sawthe level rise and fall as if it was breathing, while the third section provided a sunken retreat equipped with a railway sleeper bench and a range of plant life. Sean will use slides as part of the presentation and then hold a question and answer session for anyone who wants to ask about their own garden dilemmas. Tickets are £5 with the proceeds to be shared between St John’s Church in Longhirst and Greenfingers, Sean’s chosen charity. Doors open at 6.45pm with Sean on from 7.30pm.